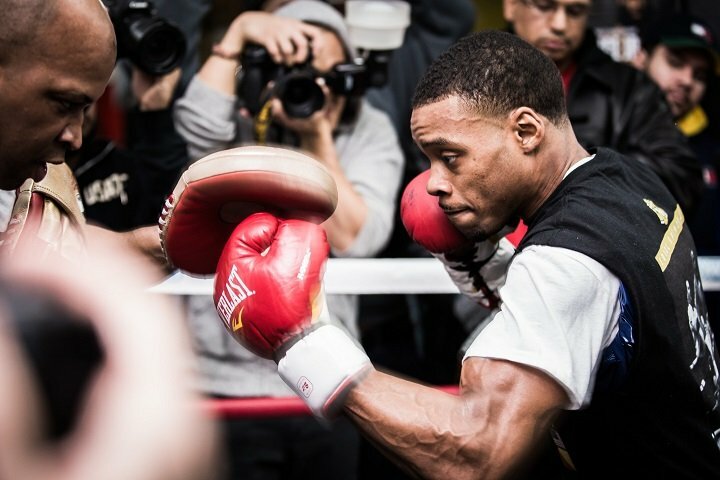 Welterweight world champion Errol Spence Jr. and former two-division champion Lamont Peterson hosted a media workout in Brooklyn on Wednesday ahead of their main event showdown this Saturday, January 20 live on SHOWTIME from Barclays Center, the home of BROOKLYN BOXING®, and presented by Premier Boxing Champions. The SHOWTIME CHAMPIONSHIP BOXING telecast begins at 9 p.m. ET/6 p.m. PT and features unbeaten lightweight world champion Robert Easter, who attended Wednesday’s media workout,taking on former champion Javier Fortuna, who was unable to make the workout due to a flight delay caused by storms in the northeast. Tickets for the live event, which is promoted by DiBella Entertainment and TGB Promotions, are priced starting at $50, and are on sale now. Tickets can be purchased at ticketmaster.com, barclayscenter.com, at the American Express Box Office at Barclays Center or by calling 800-745-3000. Group discounts are available by calling 844-BKLYN-GP. Also working out at Wednesday’s event and competing in SHOWTIME CHAMPIONSHIP BOXING PRELIMS were unbeaten light heavyweight Marcus Browne and once-beaten Francy Ntetu, who meet in a 10-round bout, plus undefeated heavyweight Adam Kownacki and once-beaten Iago Kiladze, who step into the ring for a 10-round affair. The live digital offering of Browne vs. Ntetu and Kownacki vs. Kiladze begins at 7 p.m. ET/4 p.m. PT and will be exclusive in the U.S. on the SHOWTIME Sports YouTube channel and the SHOWTIME Boxing Facebook page. Rounding out the fighters in attendance Wednesday were once-beaten Anthony Peterson, brother of Lamont Peterson, and unbeaten Brooklyn-native and 2016 Haitian Olympian Richardson Hitchins, who compete in separate undercard fight on Saturday. “I’m training for the Lamont Peterson that I know. He’s a hard worker, he’s hungry and he has a big heart. People shouldn’t look past this fight because I’m not at all. Peterson is a great fighter who’s seasoned. “Everyone knows my style. The outcome usually is a stoppage. I won’t be looking for it, but if it presents itself, I’ll be ready to take advantage. “I’m going to stick to my game plan. I can’t be worried about anything my opponent does during training camp. I have to focus on what I do best and listen to my coach. My style isn’t going to be effected by Lamont’s training. “I’m keeping the same mentality that I’ve always had heading into fights. Winning the belt helped get my name out there, but my mentality is still to grind and stay hungry and listen to my coach. Nothing is different, I still change diapers and everything else you’d imagine. “There are so many guys in the welterweight division, I want to clean them all out. If I keep beating the top guys, I’ll be the last one standing. I’m going to dominate like I’ve been doing. “I’m not going to wait around for unification fights, I want to fight three times this year and I’ll take on the best opponent who steps into the ring. “I’ll have to wait until I get into the ring to see how our power compares to each other. I’m the bigger guy but I don’t think we’ll really know until the first round. I’m going to stick to my game plan and adjust on the fly. “I expect a 12 round fight and that’s what I train for. You have to have a smart coach to make adjustments during the fight and capitalize off your opponent’s mistakes. “The hard work is over and now we’re just fine-tuning and making sure everything is perfect for Saturday. It’s been a great training camp that was tough at times, but that’s exactly how we want it. “Errol Spence is clearly a great fighter. I can see why people revere him in that way. But on Saturday, we’re going to give him a fight and he’s going to have to prove it. “I don’t have to worry about what anyone says about us leading up to this fight. I know Errol well and it happened that it was time for us to fight. This is what we do so we’ll definitely give it our all on Saturday. My mentality is to win. “I’ve been staying in the gym the whole time since my last fight. Even if I haven’t been fighting, I’ve been sparring and keeping my craft sharp. You never know how long a layoff will be, so I made sure to keep my mind on boxing. “I can’t do anything but go in there and take care of my business. I can’t control the judges or anything that happens outside of us fighting. I’m trying to win a fight and that’s all I’m concerned about. “I think the fans are really going to like this one. We may start out feeling each other, but I know from the way we both fight that it’s going to turn into a war pretty quickly. “There’s nothing that I’m really looking to expose, but doing things at the right time during the fight will be key. Errol is a solid fighter across the board and we’ll see what he brings on fight night. “The fans can expect to see what they always see in my fights. It’s going to be hard work, blood, sweat and tears. We are going to have a knockout victory in this fight. “Every fight is a big fight for me. Javier Fortuna is no stranger to this stage. He’s trying to get back to where I am, and the only thing that can stop him is me. Come Saturday night, he’s going to come up short. “Most people think I’m supposed to be drained making this weight, but I’ve been doing this since the amateurs and even before. I’m no stranger to this. Making weight is easy for me. “Sparring was really good. We had a tremendous training camp and I feel ready. I have a great team that’s gotten me perfectly prepared for this. “I’ve fought big punchers before. This is nothing new to me. We’re going to make adjustments during the fight and get him out of there early. “Don’t think that my skinny frame and long arms don’t have power in them. You will see that on display Saturday night. “We’re going after him Saturday night. I’m going to hit him wherever he gives me openings. I’m looking to finish him off on Saturday. It’s going to be a breakout performance. “A lot of guys are trying to prove they’re the best at the weight. Each fight for me is a preparation for unification bouts down the line. That’s what I really want. “It means a lot to me to be fighting at home, especially with fighters I’m so familiar with like Errol and Robert. This is a great card to start the year off. I’m ready to take the next step in my career. “It’s ‘strap season’ this year. Getting a world title is the only thing on my mind. I have to take care of what’s in front of me on Saturday. “I just want to stay busy and work and improve my craft. You don’t get better by staying idle. This is a fight that will help me stay sharp and give me a good test. “My weight is perfect and I’m in great shape right now. I’ve been staying sharp and making sure I’m ready to be at my best. “My strategy is to stay focused and stay locked-in. I don’t need to get dragged into doing anything I don’t have to. I’m looking to put on a great performance. “I feel like I’m the best in the division and it’s just a matter of time until I prove it. I have to be that confident. I’m going to show people each and every time I get in the ring. “Marcus Browne is a good boxer with Olympic experience. He’s a strong competitor and an accurate puncher. I think he’s a lot like myself as a southpaw. It’s going to be a good matchup and a chess match on Saturday. “I’m very aware of what Marcus brings to the ring and I hope he knows what I can do. We have a game plan that we’re going to implement. We’re definitely here to get the win. “I’m a smart boxer with speed and quickness. Most of all, I have a big heart. I have a great team around me and they motivate me every day. I’m a high-quality fighter and I’ll show that in the ring. “Like I’ve said before, it was an unfortunate stoppage last time I fought at Barclays Center, against David Benavidez. I felt like he was slowing down and I was going to start winning the fight. I can’t erase what happened, but I’m hoping to make a new memory at Barclays Center. “I feel great right now. I’m ready to go. I’m just working on making sure my body is 100 percent to put on a great show Saturday night. “I’ve had a nice long training camp heading into this fight. The sparring has been great and I feel like I’m going to be ready for anything Kiladze brings to the ring. “It’s huge for me to build on the momentum I started with the knockout win over Artur Szpilka. I want to keep making big statements, improve my game and give people the big fights they want. “I know Kiladze is coming up from the cruiserweight division, so I have to be ready for his speed. My sparring partners have gotten me ready for that challenge, because I think that will be the key. “Him being trained by Freddie Roach doesn’t affect me. I have to be prepared and be at my best. It’s another day at the office for me. “I have experience but I’m still learning in this sport. This is my second time fighting at Barclays Center and I’m going to be confident no matter where I fight. Working with Freddie Roach is helping me in so many ways. “Kownacki only has 14 fights, he’s not very experienced. He’s had a good run, but he’s never fought someone with my experience and skill. “I intend to out box Kownacki but I have power as well. If I can hurt him, I’ll be ready to take him out and finish the job. “We’ll never overlook an opponent. We had tremendous sparring for this fight with Murat Gassiev and others, everything is feeling great right now. “I’m getting better and better every day. Cruiserweight made me too weak to make the weight. Now that I have Freddie and I’m at heavyweight, everything is smoother than ever. “Kownacki is a big puncher with a good right hook. We know he’s dangerous but it’s nothing we haven’t seen before. “I truly believe, and I’m not saying this just because it’s my brother, I’m saying this because I know him physically, it’s going to be a TKO. Lamont is going to stop Errol in like the beginning of the 11th round. If I’m wrong, then I’m wrong. “Saturday I’m going to go in there and put on a show and get a knockout win. We’re building right now and climbing up to where we know we’re going to be. I know what’s in front of me. “People should expect fireworks. I have big things planned for this sport, including Saturday night. I want to bring big fights here and help keep the sport of boxing alive. I want to be another great fighter from Brooklyn.